The typical cadence of off-chain governance is as follows. First, a stakeholder (developer, economic actor, etc.) conducts research and develops a formal proposal. Proposal discussion then occurs across social mediums like #CryptoTwitter, online forums (ETHResear.ch, Reddit), Core Developer meetings, and/or mailing lists. The community, including Core Developers, will review the proposals, provide feedback and decide whether to accept the proposal off-chain. Generally, a significant majority is required to adopt a proposal. Once a proposal is pushed through and widely communicated, node operators will then need to upgrade their software. Proposals are typically batched together for release in a future fork (i.e the Constantinople hard fork included 5 EIPs). 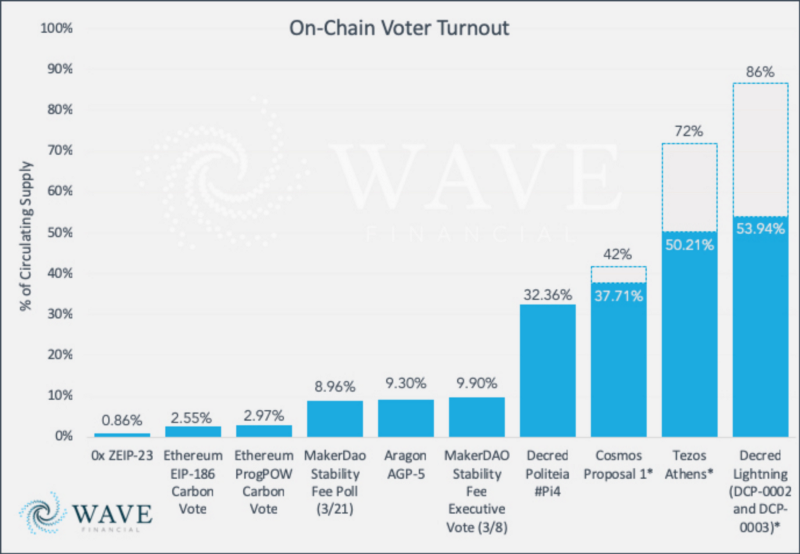 On-Chain Voter Turnout represented as a % of participating wallet addresses. Note: data is incomplete as participating wallet addresses were difficult to identify. Stepping back, the question naturally arises: why is there such a large delta within on-chain voting? To start, not all proposals are created equal: without picking on 0x, ZEIP-23 may not be as important to 0x as the stability fee is for Maker to support Dai’s peg at $1). Below are general thoughts on a few high level barriers to voter participation. On-chain governance’s underlying assumption is that because token holders and “owners” of a protocol are one and the same, they are economically incentivized to vote in the protocol’s best interest. If tokenholders vote for a proposal that has a negative effect on the protocol, the token’s price will reflect that decision and they will lose money. While voters are theoretically incentivized to govern given their passive ownership in the underlying network, they may need more “skin in the game” to actively participate. Otherwise voters will remain apathetic if the issue at hand is of a low degree of importance, as shown in practice. I believe we’ll continue to see future on-chain voting implementations be strongly coupled with direct financial incentives. Tokenholders are not always subject matter experts. For example, a casual holder of MKR may not have the economics background required to vote on the implications of an increase or decrease in Maker’s stability fee. Likewise, a retail hodler likely does not have the technical expertise required to evaluate the merits of implementing ProgPOW on Ethereum. Given the time required to truly understand the ramifications of a proposal vote, voter apathy may be higher for more complex proposals. Community leaders can help address this with market education (i.e. 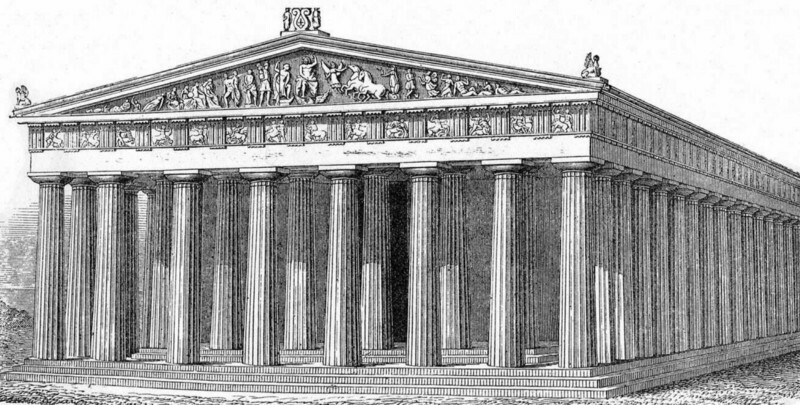 Jacob Arluck’s piece outlining Tezos Athens) but the average hodler just may not be willing to devote significant time researching the nuances and implications of a specific proposal. While there have been significant strides to improve voting infrastructure, a lack of sophisticated voting tools leads to friction when attempting to vote. 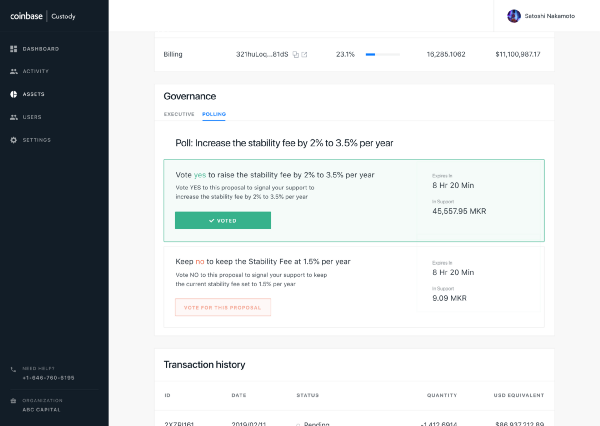 Maker actually has one of the better voting user experiences, but the below snapshot showcases the reality of all voting infrastructure today and outlines the various steps required to vote on the most recent stability fee hike. First, voters are required to have ETH in their wallets AND need to pay gas so they can connect to Maker’s voting portal, which requires 4 transactions at roughly $1. 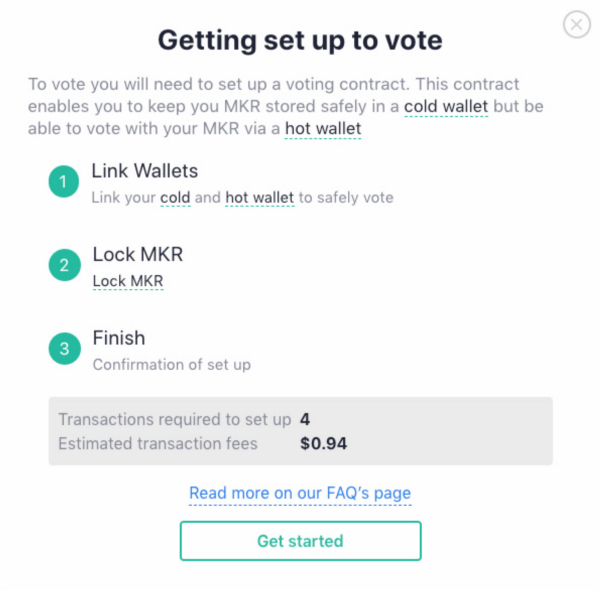 In addition, linking cold and hot wallets is a requirement — but what if smaller voters don’t have MKR on a cold wallet? Voters may get stuck and give up, as I did. 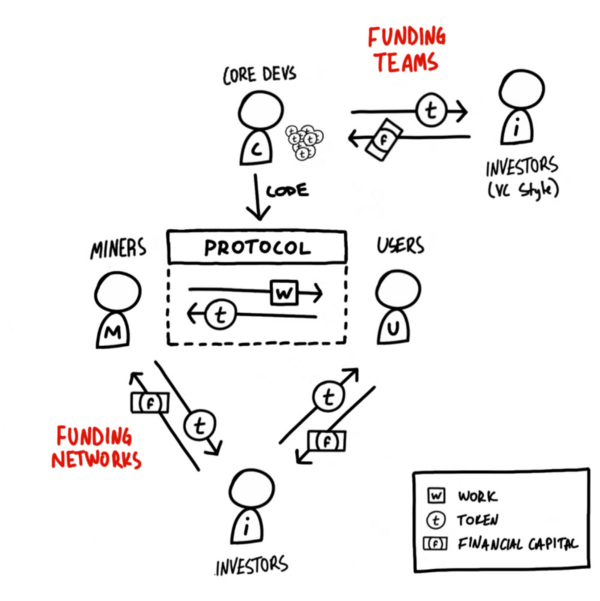 To play devil’s advocate, Maker may only want more sophisticated investors to participate and requiring a cold wallet may be a natural filter. However, the broader point still stands that meaningful improvements are needed to reduce voter friction in order for crypto to go mainstream. This rings true not just for voting, but for decentralized applications in general. Voting infrastructure will inevitably mature, with Coinbase Custody recently announcing their addition of governance support for Maker as well as intention to add Tezos voting in Q2. I expect other custodians will follow in Coinbase’s foot steps, which could lead to another potential point of centralization if a majority of voting takes place via 3rd party custodians. Unfortunately in today’s retail-driven market with little actual utility and functionality, tokenholders are mostly investors and speculators. It’s important to have all stakeholder views represented in decentralized networks, especially users. While the lack of stakeholder diversity is ultimately a byproduct of the ICO bubble, technological improvements will eventually lead to greater utility and a more balanced & diverse group of stakeholders. 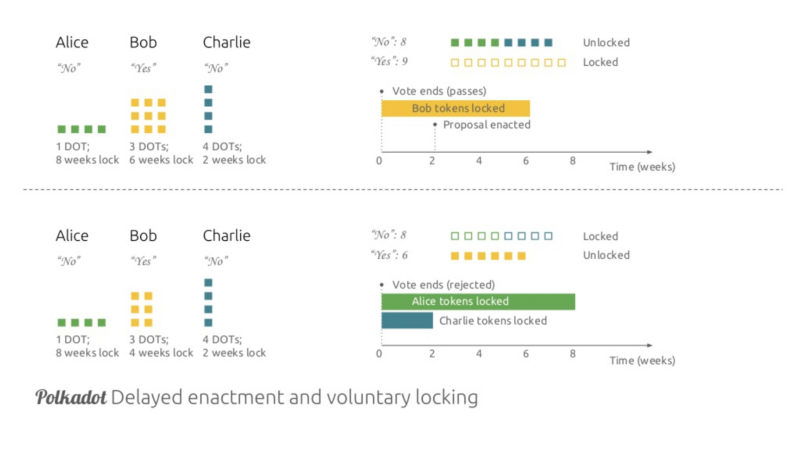 Some on-chain voting implementations require capital to be locked up for the duration of the vote (DFINITY and Polkadot both implement some form of time vote-locking, as further explored in this piece). This is by design, as voters should be held accountable for the repercussions of their vote. While insignificant today, there are still opportunity costs when locking up tokens as the voter forgoes the ability to sell, or in the near future, earn interest from lending as #DeFi infrastructure continues to mature. Purely speculation, but if many token holders are opportunistic investors as previously hypothesized, then these speculators may value this liquidity significantly more than the future value of the protocol. Tourists vs. Citizens. However, as we look to future on-chain governance implementations in the next section, these same opportunity costs can be leveraged to incentive behavior in unique on-chain governance designs. Below are a couple exciting implementations. 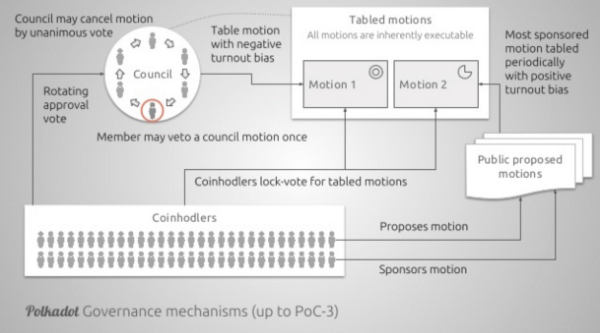 As currently outlined on GitHub, Polkadot’s governance introduces the notion of an on-chain “Council”, comprised of a fixed number of Polkadot stakeholders (envisioned to be 12-24). Each council member is elected through a staggered community Approval Vote (similar to upvoting), with members participating in a representative democracy and continuously rotating as their election term expires (1 member rotates per month). The Polkadot Council has the power to propose new “Referenda” (specific proposals)or unanimously veto potentially malicious publicly submitted Referenda as a security backstop. The Council also directly addresses potential scenarios of low voter turnout via Adaptive Quorum Biasing. The general idea behind Adaptive Quorum Biasing is that if the Council proposes a vote, and there’s low turnout, then the proposal in question requires a lot more No votes over Yes votes to reject the Referenda in question. However, in the same low voter turnout scenario, if a regular token holder proposes a vote, the proposal needs significantly more Yes votes than No votes. 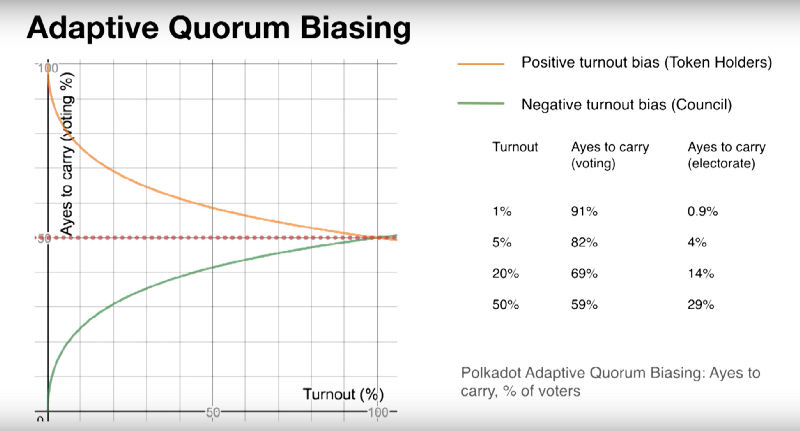 Adaptive Quorum Biasing provides Polkadot flexibility in low voter scenarios by basing voting majority requirements on turnout, making it easier or more difficult for a proposal to pass if there is no clear majority of voting power for or against it. In addition to the introduction of a council, Polkadot leverages weighted voting, based on two variables: tokens and time. time: The amount of time those tokens will remain locked after the referendum has ended, measured in multiples of enactment delay and bounded between one and six. The number of tokens are multiplied by the designated time lock to calculate the total number of votes. Weighted voting creates an interesting dynamic whereby passionate voters are able to make their votes count more by increasing their exposure to a decision. For example, a miner may be willing to take more risk and voluntarily lock their tokens for the maximum amount of time when voting for a Referenda around a change to their bottom line. If the Referenda passes, the miner’s tokens are locked and they face the economic implications of their decision by losing the ability to sell / exit the system until their tokens are unlocked. If the Referenda does not pass, the miner’s tokens are not locked and they can sell or exit the system if they feel strongly enough. This is an oversimplification of Polkadot governance process, so I urge the curious to read more on GitHub or watch Ryan Zurrer’s presentation at AraCon 2019. Neuron’s within the BNS are created via a time-locked security deposit of DFINITY’s native token, DFN. The relative voting power of a Neuron is proportional to the size of total deposits. Similar to Polkadot, if a voter wants to retrieve their deposited DFN, they must “dissolve” their deposit over a significant time period (3 months or longer as outlined in initial BNS designs), creating a strong incentive for Neurons to contribute to net-positive decisions as the value of their locked DFN could fall otherwise. In addition, DFINITY incentives voter participation by rewarding Neurons with DFN whenever they vote, with rewards being calculated proportional to the size of the Neuron security deposit and the percentage of decisions they participate in. For example, if the BNS sets voter rewards to 1%, a Neuron that has 100 DFN deposited and participates in all decisions will return 1 DFN, while another 100 DFN sized Neuron that only participations in 50% of the decisions will only return 0.5 DFN. While there is a clear incentive to participate in every vote, with potentially dangerous repercussions associated with blindly voting, DFINITY allows Neuron’s to follow the votes of other Neurons. By establishing Neuron follower relationships with trusted subject matter experts on relevant proposals, voters are able to delegate their decisions to perceived authorities. For example, one can program their Neuron to follow a number of Core Developers for protocol-level proposals, or a group of Researchers they align with philosophically. This type of “liquid democracy” allows tokenholders to actively participate in on-chain votes for specific proposals they may not have the expertise to vote on. The amount of experimentation and innovation happening in this space is exciting and provides hope that the barriers associated with low voter turnout will be solved. As a majority of the novel on-chain governance designs are unproven and purely academic at this point in time, it will be fascinating to watch these implementations play out in the wild. While on-chain governance is a double-edged sword and comes with significant trade-offs, I’m excited to continue closely watching on-chain governance evolve across the coming years. In particular, I hope to see more experimentation around Futarchy and the potential gains in efficiency speculation markets may bring to governance.